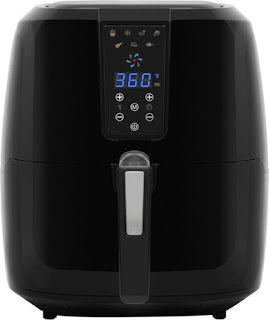 Today only, while supplies last, get this Chef di Cucina - Nutri AirFry 5.5L Digital Air Fryer for ONLY $69.99 (Retail $169.99)! Fry delicious foods without the oil when you use the Chef di Cucina Nutri AirFry air fryer. Rapid air circulation technology thoroughly cooks everything from fried chicken to donuts, while the nonstick, front-loading basket allows for easy cleanup. Featuring an LCD display and simple controls, this Chef di Cucina Nutri AirFry air lets you choose the right setting for frying, baking, grilling or roasting.